In-game advertisements in sports games are nothing new. For the most part they have been integrated well to actually enhance the immersive nature of the sports they are attempting to replicate. Madden 10 certainly has its share of sponsors displayed in differing ways though the majority of which don’t get in the way of the game being played. However since the latest patch was released there has been a level of discontent building in the community regarding the pop-up ads that appear above the scoreboard before the snap. While these ads were displayed occasionally before the patch they were merely seen as a slight annoyance and only randomly appeared. Following the second patch however reports from many indicate that the ads appear prior to almost every single play. While the particular ad in question doesn’t get in the way of anything critical it does stand out and in no way is representative of ads seen on NFL telecasts. 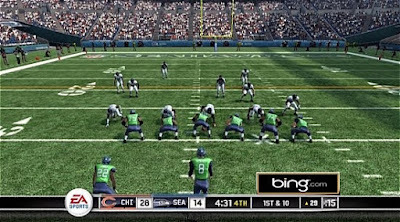 The 360 gets primarily the Bing ad while the PS3 sees a never-ending stream for Madden Arcade. Kotaku had a write-up about this very issue earlier today. Given that most of EA is on vacation for the holidays there may be no comment about it coming anytime soon. Response regarding the particular ads from gamers is mixed with some not minding while others find themselves very perturbed by them.